Q. What tests are performed during a FREE water analysis? A. The FREE in-home water analysis tests for hardness, iron, PH and total dissolved solids (TDS). An audit of your plumbing will also be conducted which will help us to determine the best place for installation of the water treatment system, type of piping and parts needed for the installation. Extremely poor water conditions or specific tests for water issues beyond hardness, iron, pH or TDS may require testing from an outside lab. Schedule your FREE water test now! Q. What should I do if the home I just bought has a Kinetico water treatment system? A. Congratulations on purchasing a home with a Kinetico system! This is a great start to providing quality water for your family. The good news is Kinetico's factory warranties are often transferrable. Please contact our Service Department for more information on the Kinetico system(s) installed in your new home. Q. My water does not seem to be soft. How can I be sure my water softener is functioning properly? A. Be sure that the water supply to the softened water is not by-passed. A member of our Service Department can test the water for hardness and check to make sure the system is regenerating as it should. Please contact our Service Department for more detailed information. Q. How will I know when it is time to add salt to my Kinetico water softener? A. Lift the lid of the brine tank to check the level of salt. If you can see water, it is time to add salt or potassium. You can add salt anytime there is enough room to accommodate at least one bag. However, keep in mind that keeping the brine tank completely full of salt can contribute to salt bridging. Q. My water softener seems to be regenerating more frequently. Is this normal? A. Remember, your Kinetico system is demand-operated, adjusting automatically to your water usage. If you do not think that your water usage has increased due to extra house guests, additional laundry or some other reason, check for any leaky plumbing, dripping faucets or running toilets; all of which can contribute to more frequent regenerations. Q. I can hear my Kinetico system running or regenerating during the day. My old softener only used to run at night. Is this normal? A. Single tank, electric water softeners tend to be set to regenerate at night because of the unavailability of soft water during the regeneration process. 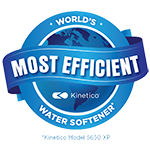 Unlike traditional water softeners, Kinetico systems operate on demand based on your water usage, without timers or electronics. So your system regenerates whenever necessary, at any time of day. And Kinetico’s twin tank design allows one tank to provide treated water while the other regenerates, so you’ll never be without soft water. Q. How can a leaking toilet affect my water softener? A. A leaking toilet means that the toilet is not shutting off completely. Perhaps it will stop and then start again suddenly. A leaking or running toilet is continuously using soft water. Besides wasting a lot of water, a leaking toilet will cause your water softener to use more salt than needed. Leaks in your plumbing or dripping faucets can also contribute to this problem. Q. Why is the water pressure of my Kinetico drinking water system so low? A. If you open your tap and don’t get any water, or only get a small stream, it could mean one of two things: your storage tank is out of water and the drinking water system is making more, or your filters need to be changed. Check your system’s PureMometer to see if the MACguard Filter has shut off. Periodically checking the PureMometer could alert you to the need for a filter changes before it happens. If the filter does not need to be changed, wait an hour or two and try to draw water from the faucet again. Q. How will I know when it is time to change the filter(s) on my Kinetico drinking water system? A. When a filter change is required, you will notice a dramatic reduction in the flow of water. The system’s PureMometer will also indicate that it’s time for a filter change. The frequency of filter changes depends on your water usage. Q. Where can I purchase filters for my Kinetico drinking water system? A. Contact us! Even if you’re unsure of what you need, we will be able to determine the type of filters your system requires by checking your installation and service history. Q. Why does it feel like I can't get the soap off of my skin when I wash with soft water? A. When you wash in soft water, you feel your skin the way it's supposed to feel, clean and silky smooth. According to the U.C. Berkeley Wellness Letter, when you wash in hard water, the soap you're using reacts with the hardness minerals in the water "to form an insoluble residue that's difficult to wash away." The "squeaky" feel/sound many people associate with being clean is, in fact, your skin sticking because of this residue. Q. Is it OK to drink soft water? A. Yes, soft water is OK for drinking and cooking. If your softener regenerates with sodium chloride (salt), keep in mind that there will be a small amount of sodium added to the softened water. People who are on sodium-restricted diets should consider the added sodium as part of their overall sodium intake. For the highest quality drinking water possible, a Kinetico reverse osmosis drinking water system will remove as much as 98 percent of total dissolved solids from your water. Q. If I have a water softener, do I need a drinking water system too? A. Water softeners improve the “water working” throughout the home. This is the water used for bathing, cleaning, laundry, etc. Softeners are not designed to improve drinking water. Drinking water systems improve the water that you use to drink and cook with by removing objectionable taste and odor. They are designed to reduce the amount of contaminants that are commonly found in city and well water supplies.